We’d love your help. Let us know what’s wrong with this preview of Love at Fourteen, Vol. 3 by Fuka Mizutani. Kanata and Kazuki are unwittingly pit against each other during a feud between the girls and boys, and their budding relationship is put to the test when personal feelings explode their mature facades! With their perfect student reputations also on the line, can Kanata and Kazuki reconcile their differences, or will their argument become someone else's gain? To ask other readers questions about Love at Fourteen, Vol. 3, please sign up. Ugh, the music teacher should be fired! Her arc with Nagai takes up a substantial portion of the book, and my skin just crawled the whole time. Watching Tanaka and Yoshikawa struggle through their first fight was absolutely lovely and rewarding, but overall this volume just felt kinda gross. I’m going to keep reading to find out where the author is going with this, but I’m glad I had even a veiled warning that this series wasn’t going to stay the same as the first volume. I love how realistic this series is. It’s mature, in the way that it handles first love, and the way they’re mature characters, while insecure. The way the characters look at each other, their feelings develop, is subtle and slow, but at a steady, realistic pace. Kanata and Kazuki have a fight, without meaning to or understanding how it happened. They try keeping up their good faces in front of their classmates. And then they make up, and it’s shy and sweet. They go out together, try to do things to impress each other. Kanata tries lip gloss, and wants Kazuki to notice. Then there’s Nagai, who tends to show anger when he gets attention. I know some people will be uncomfortable with his developing relationship with their teacher, but I’m not. Maybe I should be, given I’m not sure how far apart in age they all are. But I kind of like how she teases him, pushes him. And how, in return, he’s starting to get to her. And Shiki. I cannot express how pleased I am this series has straight couples (potential ones), and a gay character. I love it! She’s in love with Kanata, and I enjoy the way she thinks in third-person. She gets little chapters of thoughts, showing her feelings and growing friendship with Kanata, as well as her jealousy of Kazuki. I’m so impressed with this. Then we got peaks of new characters at the end of the volume. I don’t know if we’ll see more of them, but I love the glimpses we get of other characters. Just little thoughts from main and side characters in snipets, the subtly showing worlds of thought and growth and work. I love this series already. I’m wildly impressed with the development and thought and complexity. I can’t wait for the next one, every time. It has been such a long time since I've read Vol. 2. But I have never forgotten this adorable manga. This author is seriously good. Her stories are all real and fluffy and cute and nice. Kanata and Kazuki have a little fight. After this silly fight, each one of them is thinking that the other must be upset and are willing to take the first step (since they are both very mature). Due several failed meetings, their fight takes longer to be solved. But when it is... it was so sweet I got all teary e It has been such a long time since I've read Vol. 2. But I have never forgotten this adorable manga. This author is seriously good. Her stories are all real and fluffy and cute and nice. So we have some trouble in paradise in this volume. I liked it. Some of you might be going, "but Selena, you've commented in the past with this manga that you liked how there wasn't any manufactured drama." To which I say, there's still no manufactured drama. This is pretty realistic problems a 14 year old would have, and the way it happens is pretty natural. It doesn't feel forced, nor does it feel like it's a plot device. It's just a natural progression of the story, and it is resolved in a norm So we have some trouble in paradise in this volume. I liked it. This is pretty realistic problems a 14 year old would have, and the way it happens is pretty natural. It doesn't feel forced, nor does it feel like it's a plot device. It's just a natural progression of the story, and it is resolved in a normal way, without being dragged out or made a bigger deal than it actually is. 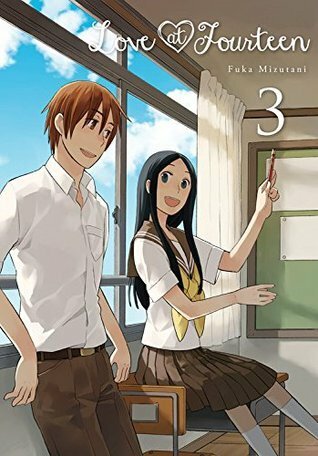 This third volume of Love @ Fourteen had a rather slow pacing in the middle, though the beginning and the ending were very absorbing to read and had a good plot and pace. I enjoy both couples, Kanata and Kazuki (the main or alpha couple) and Nagai and the music teacher (the beta couple). It's kind of weird to be cheering on a teacher and student dating, but they are good together and it is fiction. Not as good as Vol. 2, but better than the first volume. A solid installment. I don't even see why the plot point of the music teacher and student continues. Not only are the actions of the teacher illegal, but she also manipulates a later situation so she can spend even more time with Nagai and use that to her advantage. Her actions are disgusting and she should be terminated from her position. This series is so sweet. But again, my only problem with it is the portrayal of adults falling in love with fourteen year olds. Like, meh? But thankfully, these two scenarios are subplots. I am enjoying this series but I really don't care for Hinohara interactions with Nagai. I feel like it's supposed to be seen as cute but I only find it creepy. When she smiles at him it's like the kind of smile a killer would give their victim they have cornered before a commercial break. Ugh, the teacher arch is so creepy... Yet everything is still to plain to care too much about. You could read Doukyuusei to see how it's done properly. Another great, super cute volume! I LOVED the storylines in this one. (view spoiler)[Particularly the fight/conflict between Kanata and Kazuki. ;P (hide spoiler)] The intermissions always seem to have my favourites scenes in them though. Like, for example, in this volume I really found all of the characters dreaming about each other as Romeo/Juliet to be super entertaining and charming! (The artwork to go along with them is my favourite out of all the volumes now too!) And, of course, it's just Another great, super cute volume! I LOVED the storylines in this one. (view spoiler)[Particularly the fight/conflict between Kanata and Kazuki. ;P (hide spoiler)] The intermissions always seem to have my favourites scenes in them though. Like, for example, in this volume I really found all of the characters dreaming about each other as Romeo/Juliet to be super entertaining and charming! (The artwork to go along with them is my favourite out of all the volumes now too!) And, of course, it's just really nice to get more character development and backstory for all the characters, as per usual. I've come to really have a soft spot for Shiki actually (though I really do love all of the characters). This entire series has been so cute and amazing; I'm really loving it. So cute I can't handle it. This series keeps getting cuter with each volume. The story I'm really liking. Another cute volume. The art is just as good as ever. This series is just cute. And honest. I like that.